Tips and tricks to get employees behind CRM initiatives and other organisational changes. People typically find change difficult and various studies show that a large portion of CRM implementation projects fail, often due to poor user acceptance of the new platform. In the corporate world, consulting companies charge hefty fees to help you manage change: they sell workshops, offer project management services and support for the leadership team. RunMags is all about cost effectiveness and our mission is to make magazine publishing manageable and profitable. That’s why we have created this Do-It-Yourself Guide on how to manage change within your organization and thereby saving money that otherwise would be spent on consultants. To support our customers in implementing RunMags in their organization, we have developed a RunMags specific change management methodology and best practices. As RunMags is really a CRM, marketing, fulfillment and billing system, the method is certainly focused on managing the challenges concerning implementing an IT platform, changing business processes, and motivating staff, but the foundation is generic in nature and can be used for virtually any change project. Use this guide to avoid the pitfalls often associated with an organizational change, the implementation of a CRM platform or the roll out of your new sales rep bonus scheme. As organization structure, culture and history varies from publisher to publisher, managing the change process when introducing a new company-wide software tool is bespoke by default. In a hierarchical organization, the change can be dictated in a very different manner than in an organization with a more informal management culture. But that doesn’t mean that it will last. It might just become the new flavor of the month that the staff adapts to, knowing that in six months, there will be a new thing. The RunMags change management methodology is created to provide a framework that can be used in a very pragmatic fashion, regardless of which organization we’re implementing our software in. Key is that management is aware of the challenges and actively communicates to support the change throughout the various stages. We must certainly manage the technical aspects of rolling out the software, but the softer side of the change is equally important - and this is what most organizations miss. In order to be successful, you absolutely HAVE to understand the personal drivers of your staff and align them with your change project. Change Acceleration Process (CAP) is a Six Sigma best practice for quickly changing the way an organization operates ... and (very importantly) making the change last. Ask any seasoned CRM project manager and he or she will tell you this can be quite challenging and increasingly so in a large organization. CAP is a pre-defined Six Sigma process with steps for moving from the current state to an improved state by speeding up the transition state. The best practice is that a technical strategy alone is insufficient to guarantee success. Rather, it is lack of attention to cultural factors that tend to derail projects when there is a failure. Failure, for our purposes, is defined as failing to achieve the anticipated benefits of the project (i.e., the benefits that justified the project in the first place). The RunMags change management methodology is based on the principles of CAP, but where CAP provides support for any type of change project, the RunMags change management methodology specifically support the steps in implementing RunMags in a publishing company. In essence, CAP is a seven step process for moving from the current state to an improved state. First and foremost, authentic, committed leadership throughout the duration of the initiative is essential for success. From a project management perspective, there is a significant risk of failure if the organization perceives a lack of leadership commitment to the initiative. Before you present RunMags as a solution to employees and other key stakeholders, you must define the problems you're trying to solve. Spend time on making sure you can identify and highlight some three or so major problems each group of stakeholders are dealing with on a daily basis. Meet with each group or stakeholders and really highlight the problems and explain that your trying to identify a solution that will make the pain go away. For the sales staff this can be double-entry of sales orders, for production it can be managing copy, for management it can be getting proper insight to run the business. After a week or so, schedule another meeting with each of the stakeholder groups. This time, communicate very visually how you believe the organization should work and the tools that should support the key processes. At this point, if you are a project manager or sponsor, you should know RunMags very well so that you understand the tools available and how they can fit into your organization's key business processes. For each group, tell stories from the daily operation and describe in what way RunMags will help them go about things. Make sure the stories aligns with removing the key pain points in step 2. When implementing a platform like RunMags, you can't just rely on an official commitment from people. It's not enough with them saying they will do everything in their power do help the project to success. You have to get them to really want RunMags and any new processes because the solution will remove the pain they are currently experiencing. In almost any organization, you'll find individuals that that are pro change and those that oppose change. It doesn't matter how bad things have been in the past, anything new will just be perceived as a threat. Sales reps who have built a career on being lone wolves, keeping their clients away from the company will go to great lengths not to have to enter information in RunMags. Under-performing managers who have been able to slide by because disjointed legacy systems haven't supported honest and transparent reporting may feel that RunMags will expose them. To combat any nay-sayers, you have to form a core leadership team with pro change individuals from different departments. This cross-functional team should not be larger than eight people in a large organization but no less than two people in a small organization. Steps 2-4 are primarily about accelerating adoption of your changes. Steps 5-7 are about making the changes permanent. You leverage early wins, taking the knowledge gained in your pilots and transfer learning’s and best practices to your broader rollout. You plan for integrating with other existing, potentially competing, initiatives. You assess what is helping and hindering the initiative. 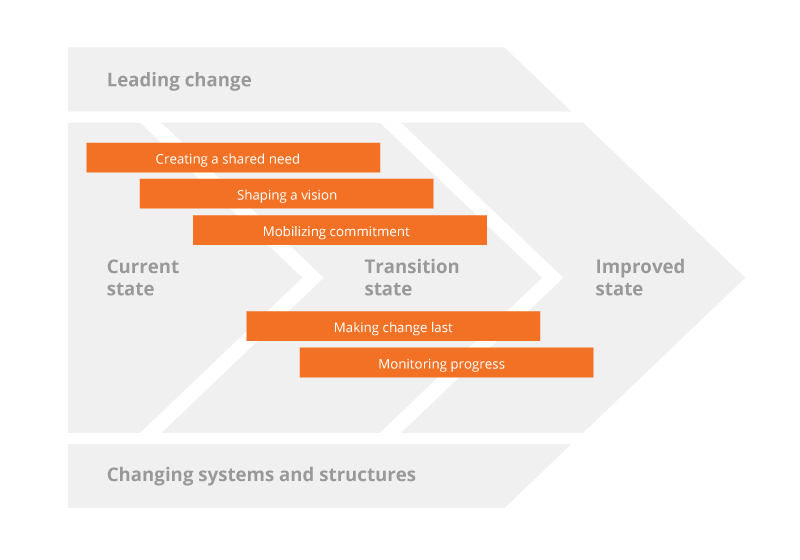 It is important to plan for measuring the progress of your change initiative. Is it real? How will you know? You need to set benchmarks — realize them – and celebrate! Similarly there must be accountability for lack of progress.